584,000 Square feet of contiguous convention exhibit and trade show space. The 584,000 sq. ft. exhibit floor is made up of six event halls that can be combined in a variety of configurations. 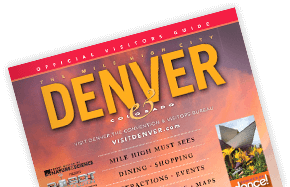 The Colorado Convention Center offers 584,000 square feet of contiguous event or trade show exhibit space, all on one level. The hall can be divided into sections of approximately 100,000, 200,000, 300,000, 400,000 or 500,000 square feet. A clear span area in Hall A provides unobstructed seating for 7,000 people. Five trade show offices overlook the entire exhibit floor through large glass windows. Floor pockets are on 30-foot centers, while columns are at 90-foot centers. There are nine concession areas serving the floor. All signage is placed near the ceiling where it is easy to read, even above exhibits.